Going reusable is an important part of reducing waste. By reusing bags when you go shopping, you help to reduce the amount of single-use plastic bags that become litter or head to the local landfill. Reducing waste prolongs the life of the landfill and ensures a better quality of life for all residents of the Zero Waste Communities. Do your part for the environment and your community by going reusable! In an effort to decrease the use of plastic bags and reduce waste, the Zero Waste Communities of San Bernardino County are launching a Reusable Bag Campaign pilot program. 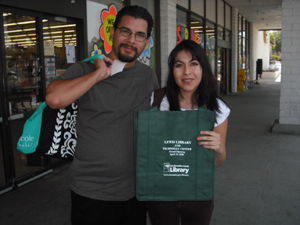 The program is establishing partnerships with local grocery stores and community groups to encourage and remind residents in their perspective city to bring and utilize reusable bags whenever they are grocery shopping.